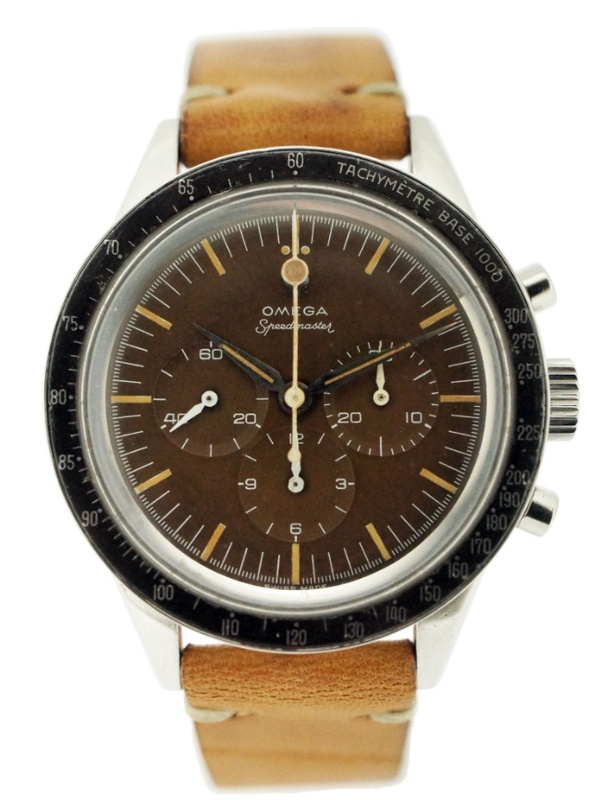 CONDITION REPORT: All original dial, hands, bezel, crown and case as well as its original steel bracelet. The tropical dial is a beautiful light brown dial and the radium and surface are impeccable and untouched. The case appears to be unpolished and the lugs are still in their thick original state. This reference CK2998-1 is the first Speedmaster with the 2998 reference and the lollipop chronograph hand. This particular watch has a beautifully aged ‘tropical’ brown dial. The watch, with a 17 million serial number, is 100% correct. The dial, lollipop chrono hand, dagger counter hands and h/m alpha hands are correct for this reference. This is one of the nicest examples for this reference with a tropical dial and is extremely rare and collectible. It comes with an archives extract from the Omega museum & its original papers.